An illustration of various experiments and instruments by Jabir Ibn Hayyan. Astrolabe with angular scale and navigational astrolabe: Astrolabes were further developed in the medieval Islamic world, where Muslim astronomers introduced angular scales to the design, adding circles indicating azimuths on the horizon. It was widely used throughout the Muslim world, chiefly as an aid to navigation and as a way of finding the Qibla, the direction of Mecca. 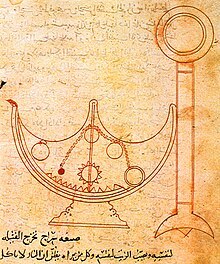 8th-century mathematician Muhammad al-Fazari is the first person credited with building the astrolabe in the Islamic world. The Cantigas de Santa Maria, c. 1260, captured some of the musical instruments introduced from Muslim dominated Andalusia to Southern Europe. The plucked and bowed versions of the rebab existed alongside each other. Checkmate: In early Sanskrit chaturanga (c. 500–700), the king could be captured and this ended the game. In shatranj/chess, the Persians (c. 700–800) introduced the idea of warning that the king was under attack (announcing check in modern terminology). This was done to avoid the early and accidental end of a game. Later the Persians added the additional rule that a king could not be moved into check or left in check. As a result, the king could not be captured, and checkmate was the only decisive way of ending a game. 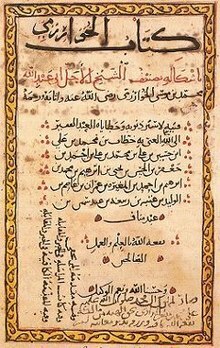 The first page of Al-Kindi's manuscript On Deciphering Cryptographic Messages, containing the oldest known description of cryptanalysis by frequency analysis. A page from Al-Khwārizmī's al-Kitāb al-muḫtaṣar fī ḥisāb al-ğabr wa-l-muqābala. Grab and clamshell grab: The mechanical grab, specifically the clamshell grab, was invented by the Persian Banu Musa brothers and described in their Book of Ingenious Devices in the 9th century. It was an original innovation by the Banu Musa that does not appear in any earlier Greek works. The grab described by the Banu Musa was used to extract objects from underwater, and recover objects from the beds of streams. Hurricane lamp, self-trimming lamp, self-feeding lamp: Some of the other devices the Banu Musa invented include a hurricane lamp, self-trimming lamp (by Ahmad ibn Mūsā ibn Shākir), and self-feeding lamp. rabel, gittern, mandola, kopuz, gambus: The Cantigas de Santa Maria, c. 1260, captured some of the musical instruments introduced from Muslim-dominated Andalusia to Southern Europe. The plucked and bowed versions of the rebab existed alongside each other. The bowed instruments became the rebec or rabel and the plucked instruments became the gittern. Curt Sachs linked this instrument with the mandola, the kopuz and the gambus, and named the bowed version rabâb. Syringe: The Iraqi/Egyptian surgeon Ammar al-Mawsili invented a syringe in the 9th century using a hollow glass tube, providing suction to remove cataracts from patients' eyes. Pascal's triangle: The Persian mathematician Al-Karaji (953–1029) wrote a now lost book which contained the first description of Pascal's triangle. It was later repeated by the Persian poet-astronomer-mathematician Omar Khayyám (1048–1131); thus the triangle is also referred to as the "Khayyam triangle" in Iran. Earth's circumference calculation with trigonometry: An accurate estimate was provided in Al-Biruni's Codex Masudicus (1037). In contrast to his predecessors, who measured the Earth's circumference by sighting the Sun simultaneously from two different locations, Al-Biruni developed a new method of using trigonometric calculations, based on the angle between a plain and mountain top, which yielded more accurate measurements of the Earth's circumference, and made it possible for it to be measured by a single person from a single location. Spinning wheel and silk-twisting machine: The earliest clear illustration of the spinning wheel comes from Baghdad, drawn in 1237. There is evidence that spinning wheels had already come into use in the Islamic world during the eleventh century. The spinning wheel was most likely invented in the Islamic world. The earliest reference to a similar device, a silk-twisting machine, is dated to 1030. The spinning wheel was a precursor to the spinning jenny, which was widely used during the Industrial Revolution. The spinning jenny was essentially an adaptation of the spinning wheel. Syndrome: Avicenna, in The Canon of Medicine (published 1025), pioneered the idea of a syndrome in the diagnosis of specific diseases. Tusi couple: The couple was first proposed by Nasir al-Din al-Tusi in his 1247 Tahrir al-Majisti (Commentary on the Almagest) as a solution for the latitudinal motion of the inferior planets. The Tusi couple is explicitly two circles of radii x and 2x in which the circle with the smaller radii rotates inside the Bigger circle. The oscillatory motion be produced by the combined uniform circular motions of two identical circles, one riding on the circumference of the other. Kocher's method and Walter position: Al-Zahrawi's Kitab al-Tasrif described both what would later become known as "Kocher's method" for treating a dislocated shoulder and the "Walcher position" in obstetrics. Ligature for migraine and migraine surgery: Described in the work of Al-Zahrawi (936–1013), Kitab al-Tasrif, one of the most influential books in early modern medicine. It describes the process of performing a ligature on blood vessels. He was the first to describe a surgical procedure for ligating the temporal artery for migraine, also almost 600 years before Ambroise Paré. Lithotrite: In urology, al-Zahrawi wrote about taking stones out of the bladder. By inventing a new instrument, an early form of the lithotrite which he called "Michaab", he was able to crush the stone inside the bladder without the need for a surgical incision. Modern surgery: Abu al-Qasim al-Zahrawi (936–1013), better known in the west as Albucasis, is regarded as the father of modern surgery. His Al-Tasrif is one of the most quoted surgical textbooks of all time. Dental extraction and replantation: Al-Zahrawi has been credited as the first to use extraction and replantation in the history of dentistry. Surgical instruments: Al-Zahrawi introduced over 200 surgical instruments, many still in use today. Pathology: Various Muslim physicians in Spain were crucial in the development of modern medicine. Pathology was an important development in medicine. 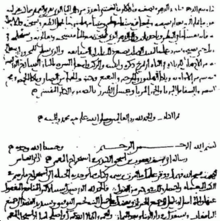 The first correct proposal of the nature of disease was described by Al-Zahrawi and Ibn Zuhr. Crankshaft: Al-Jazari (1136–1206) is credited with the invention of the crankshaft. The crankshaft appears in two of his water-raising machines, a chain pump and his twin-cylinder pump, including both the crank and shaft mechanisms. The crankshaft later played an important role in the Industrial Revolution, and is central to modern machinery such as the steam engine, internal combustion engine and automatic controls. Two-cylinder reciprocating piston pump and double-action piston mechanism: Al-Jazari's invention of the two-cylinder reciprocating piston pump featured the first known example of a double-action piston mechanism. Griot: The griot musical tradition originates from the Islamic Mali Empire, where the first professional griot was Balla Fasséké. Programmable humanoid robot and musical robot band: In 1206, Al-Jazari invented a programmable humanoid automata band. According to Charles B. Fowler, the automata were a "robot band" which performed "more than fifty facial and body actions during each musical selection." Banjo: Gerhard Kubik notes that ancestors of the banjo were brought to America by Muslim African slaves from Islamic regions of West Africa. Blues and field holler: The historian Sylviane Diouf and ethnomusicologist Gerhard Kubik trace the origins of the blues to Islamic music. Diouf notes a striking resemblance between the Islamic call to prayer (originating from Bilal ibn Rabah, a famous Abyssinian African Muslim in the early 7th century) and 19th-century field holler music, noting that both have similar lyrics praising God, melody, note changes, "words that seem to quiver and shake" in the vocal chords, dramatic changes in musical scales, and nasal intonation. She attributes the origins of field holler music to African Muslim slaves who accounted for an estimated 30% of African slaves in America. According to Kubik, "the vocal style of many blues singers using melisma, wavy intonation, and so forth is a heritage of that large region of West Africa that had been in contact with the Arabic-Islamic world of the Maghreb since the seventh and eighth centuries." Kubik also notes that stringed instruments were generally favored by Muslim African slaves, while drumming was generally favored by non-Muslim African slaves. Impulse steam turbine: An early steam turbine was invented in 1551 by Taqi al-Din, a philosopher, astronomer and engineer in 16th century Ottoman Egypt, who described a method for rotating a spit by means of a jet of steam playing on rotary vanes around the periphery of a wheel. Al-Din's device was the first impulse steam turbine, predating the later impulse steam turbine of Giovanni Branca (1629), who may have been inspired by al-Din. Steam jack and practical steam turbine: A steam-powered roasting jack was first described by the Ottoman polymath and engineer Taqi al-Din in his Al-Turuq al-samiyya fi al-alat al-ruhaniyya (The Sublime Methods of Spiritual Machines), in 1551 CE (959 AH). It was a steam turbine with practical applications as a prime mover for rotating a spit. A similar device for rotating a spit later described by John Wilkins in 1648. 'Turnspit steam engine and practical steam jet: Taqi al-Din described the first turnspit driven by a steam engine. He was the first to used a steam jet impinging on the blades of a wheel to drive a spit, and it was the first practical steam jet device, predating John Wilkins in 1648. Flush deck: The flushed deck design was introduced with rice ships built in Bengal Subah, Mughal India (modern Bangladesh), resulting in hulls that were stronger and less prone to leak than the structurally weak hulls of traditional European ships built with a stepped deck design. This was a key innovation in shipbuilding at the time. The British East India Company later duplicated the flushed deck design of Bengal rice ships in the 1760s, leading to significant improvements in seaworthiness and navigation for European ships during the Industrial Revolution. ^ a b c Sachs, Curt (1940). The History of Musical Instruments. New York: W. W. Norton & Company. pp. 151–153. ^ Pacey, Arnold (1991) . Technology in World Civilization: A Thousand-Year History (First MIT Press paperback ed.). Cambridge MA: The MIT Press. p. 23. ^ Pacey, Arnold (1991) . Technology in World Civilization: A Thousand-Year History (First MIT Press paperback ed.). Cambridge MA: The MIT Press. p. 24. ^ a b Cosman, Madeleine Pelner; Jones, Linda Gale (2008). Handbook to Life in the Medieval World. Handbook to Life Series. 2. Infobase Publishing. pp. 528–530. ISBN 978-0-8160-4887-8. ^ Shevel, E; Spierings, EH (April 2004). "Role of the extracranial arteries in migraine headache: a review". Cranio : The Journal of Craniomandibular Practice. 22 (2): 132–6. doi:10.1179/crn.2004.017. PMID 15134413. ^ Elgohary, Mohamerd Amin (April 2006). "Al Zahrawi: The Father of Modern Surgery" (PDF). Annals of Pediatric Surgery. 2 (2): 82–87. ^ Raffensperger, John G. (2014). Children's Surgery: A Worldwide History. McFarland. p. 51. ISBN 9780786490486. ^ Ingle, John Ide; Baumgartner, J. Craig (2008). Ingle's Endodontics. PMPH-USA. p. 1281. "The individual first credited with the principle of extraction and replantation was an Arabian physician by the name of Abulcasis who practiced in the eleventh century." ^ Ingle, John Ide; Bakland, Leif K. (2002). Endodontics. PMPH-USA. p. 727. "Abulcasis, an Arabian physician practicing in the eleventh century, is the first credited with recording the principle of extraction/replantation." ^ Holmes-Walker, Anthony (2004). Life-enhancing plastics: plastics and other materials in medical applications. London: Imperial College Press. p. 176. ISBN 978-1-86094-462-8. ^ a b Cropley, David (2019). Homo Problematis Solvendis - Problem-solving Man: A History of Human Creativity. Springer. p. 50. ISBN 9789811331015. ^ Cropley, David (2019). Homo Problematis Solvendis - Problem-solving Man: A History of Human Creativity. Springer. p. 51. ISBN 9789811331015. ^ Hill, Donald (1998). Studies in Medieval Islamic Technology: From Philo to Al-Jazarī, from Alexandria to Diyār Bakr. Ashgate. ISBN 978-0-86078-606-1. ^ Cropley, David (2019). Homo Problematis Solvendis - Problem-solving Man: A History of Human Creativity. Springer. pp. 50–51. ISBN 9789811331015. ^ Alexander, Leslie M.; Jr, Walter C. Rucker (2010). Encyclopedia of African American History [3 volumes]. ABC-CLIO. p. 48. ISBN 9781851097746. ^ a b c Curiel, Jonathan (15 August 2004). "Muslim Roots of the Blues". SFGate. San Francisco Chronicle. Archived from the original on 5 September 2005. Retrieved 24 August 2005. ^ a b Taqi al-Din and the First Steam Turbine, 1551 A.D. Archived 2008-02-18 at the Wayback Machine, web page, accessed on line October 23, 2009; this web page refers to Ahmad Y Hassan (1976), Taqi al-Din and Arabic Mechanical Engineering, pp. 34–5, Institute for the History of Arabic Science, University of Aleppo. ^ Wilson, David Gordon; Korakianitis, Theodosios (2014). The Design of High-Efficiency Turbomachinery and Gas Turbines. MIT Press. p. 3. ISBN 9780262526685. ^ Kalın, İbrahim (2014). The Oxford Encyclopedia of Philosophy, Science, and Technology in Islam. Oxford University Press. p. 317. ISBN 9780199812578. ^ CME: The Chartered Mechanical Engineer. Institution of Mechanical Engineers. 1978. p. 84. The above description, which was made in 1551, indicates clearly that the Moslems were the first people to use a steam jet impinging on the blades of a wheel to drive a spit. ^ CME: The Chartered Mechanical Engineer. Institution of Mechanical Engineers. 1978. p. 84.